The mission of the MPO is to maintain a continuing, comprehensive, and cooperative planning process. Led by two MPO committees, the process is designed to encourage involvement by all interested groups, such as the business community, neighborhood associations, environmental organizations, social service agencies, educational institutions, and the general public. The MPO in coordination with local governments, local transportation agencies, Georgia Department of Transportation, and Federal Highway and Transit Administration conduct the transportation planning process. 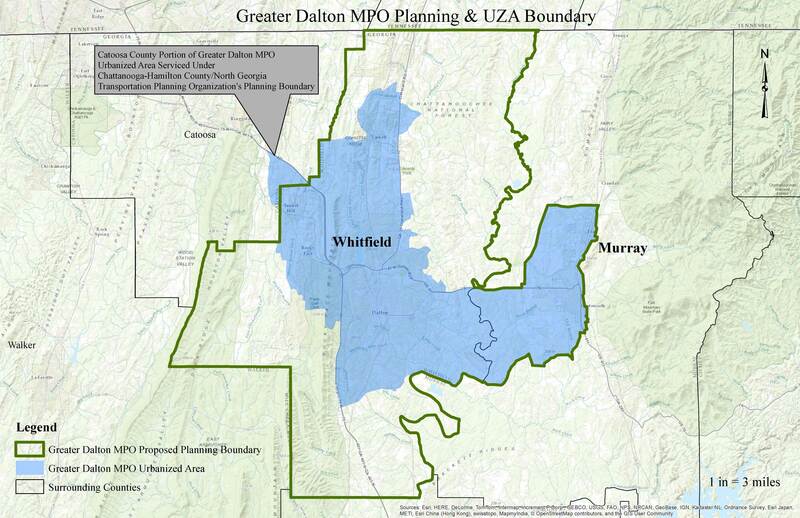 The Greater Dalton Metropolitan Planning Organization (GDMPO) is the intergovernmental transportation planning body for Whitfield County and a portion of western Murray County. The GDMPO conducts the federally mandated transportation planning process for the Greater Dalton Urbanized Area, as identified in the 2010 U.S. Census..
An important part of this planning process is the public's participation in developing long term goals and setting short term priorities for the region's transportation system. We invite you to review the information and plans provided here, and provide us with your thoughts and feedback regarding the transportation issues facing our area.